If you want to learn C language and become a pro of this programming language then you should know the main features of this language. In this blog I am going to tell you about the essential features of C language. 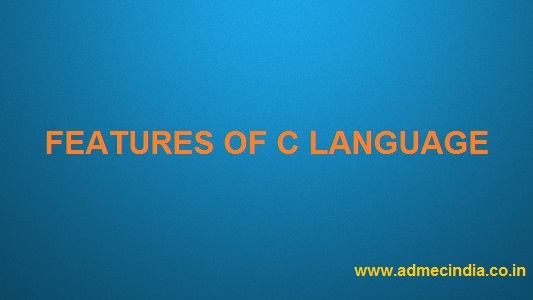 So, we start our discussion on the features of C, you must know about the C language. Let's have a look at it brief introduction. C is very simple and easy language. It was developed by DENNISH RITCHIE in 1972 at BELL LABS . This language is mainly used for develop desktop based application. C programming covers basic features of all programming language. It is one of the widely used language in the world. It provides lots of features that are given blow. C programming can be written in English language so that it is very easy to understand and developed by programmer. It provides break the problem into parts, rich set library function, data types etc. This programming language is very Strong(Powerful) language. It is case sensitive programming language. In C programming ‘break and BREAK’ both are different. C programming is a platform dependent language. Whenever the program is execute in the same operating system where that was developed and compiled but not run and execute on other operating system. C Language is compiler based programming language that means without compilation no C program can be executed. First we need compiler to compile our program and then we'll able to execute it. Unlike assembly language, C programs can be executed in many machine with little bit or no change. But it is not platform-independent. C is also used to do low level programming language. It is used to develop system application kernel, driver etc. It also supports the features of high level language. That is why it is known as mid-level language. C is structured programming language in the sense that we can break the program into parts using functions. So, it is easy to understand and modify. C programming language offers alot of prdefine functions that makes the development fast. It supports the features of dynamic memory allocation. In C language, we free the allocated memory at any time by calling the free() function. Fast speed. C language provides the feature of pointers. We can directly interact with the memory by using the pointers. We can use pointers for memory, functions, array etc. In C programming we can call the function within the function. It provides code reusability for every function. So, these are some features of this structured programming language. Hope this blog would be beneficial for you to understand the C language. To enhance your programming skills and to become a C programmer you should definitely go head for advanced C courses offered by one of the best C Training Institute in Delhi. ADMEC Multimedia Institute is imparting highly professional training in C language under the guidance of industry experts.